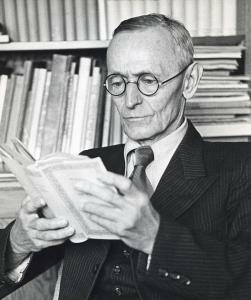 The most complete collection of the books by Hermann Hesse you will ever find on the Internet. There never was an official compilation of the works på Hermann Hesse in English. Here I have tried to sort out the works currently in the Public Domain and edited the works for the PDF-format. If a page is missing, it is because I have removed empty pages for faster downloads. Also, the books are converted to searchable texts, for the analysts. As I find more texts by Hesse I will post them here, and if you come across some you are most welcome to let me know. Ludi), each of which explores an individual’s search for authenticity, self-knowledge, and spirituality. I will not go into details about the life of Hermann Hesse, since there is an excellent biography of his life and work as an introduction to “Poems by Hermann Hesse”.